Oklahoma Department of Transportation managed to complete a $60 million reconstruction of a heavily-traveled portion of I-40 in Canadian County a full nine months ahead of schedule. Work began on the seven-mile stretch of I-40 in June of 2009, after ODOT determined the roadway could use some safety improvements. An average of 40,000 vehicles traveled this stretch of interstate every day, with 28 percent of that number attributed to commercial trucks. Parade Magazine had recently run results of a survey of commercial truck drivers, who had stated that this section of I-40 was one of the toughest spots throughout the nation's entire interstate system. ODOT's project included roadway reconstruction, resurfacing, and reconstruction of three sets of bridges, all while keeping two of the three lanes of east- and west-bound traffic open in order to ease the inconvenience for drivers. The project was able to see progress quicker than anticipated due to $30 million in funding made available to the project through the 2009 American Recovery and Reinvestment Act. ODOT also evaluated and streamlined the sequence of construction in order to expedite the project. Thanks to the quick delivery by ODOT, the project was completed on December 8, 2010. 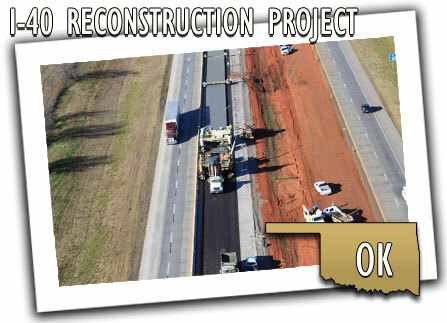 The project, one of the largest in the state funded by the stimulus, signaled repair and revitalization to the transportation system in Oklahoma. ODOT was able to make one of central Oklahoma's vital commercial routes safer and more efficient roughly 270 days early and with little hassle to drivers across the state.